Navaratri (Sanskrit: नवरात्रि) is a festival dedicated to the worship of the Hindu deity Durga. 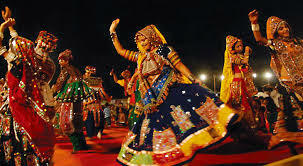 The word Navratri means ‘nine nights’ in Sanskrit, nava meaning nine and ratri meaning nights. During these nine nights and ten days, nine forms of Devi are worshipped. The tenth day is commonly referred to as Vijayadashami or “Dussehra” (also spelled Dasera). Navaratri is an important major festival and is celebrated all over India and Nepal. Diwali the festival of lights is celebrated twenty days after Dasera. Though there are in total five types of Navaratri that come in a year, Sharada Navaratri is the most popular one. Hence, the term Navaratri is being used for Sharada Navaratri.